Multifunction, multi-voltages, multirange timer relay - 2 timed contacts/2 instantaneous contacts - 3 A.
Pluggable on the following sockets : SVB, SPVB, SRC, SVDL, SPVDL and SRDL 4.8. TIMING RANGE : 0,1 s to 1 h.
"function" and "range" selection made by switches on front face and timing adjustment by potentiometer. Green and red LEDs indicate voltage and function statement. 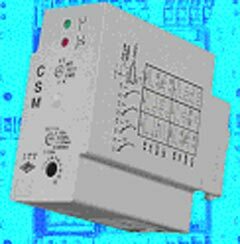 CSM relay conforms with EC standard.